The Asian Canadian Writers' Workshop (ACWW) is pleased to announce the winner of the 2017 Jim Wong-Chu Emerging Writers Award for poetry. 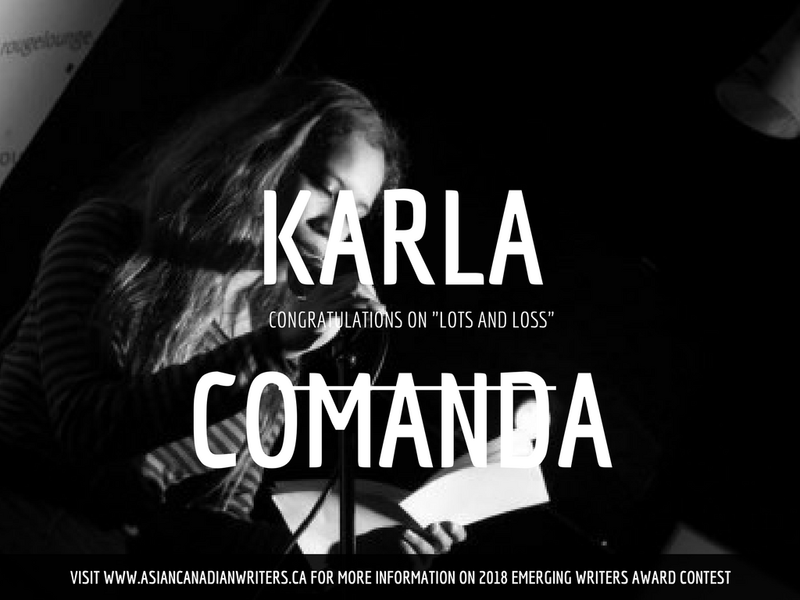 Congratulations to Karla Comanda. Her highly accomplished poetry "salvages family memorabilia" to unpack the complex layers of Filipino Canadian immigrant experiences. With transnational scope, she explores the fraught lines of kinship, ethnic divisions, language, politics, religion, and food. These poems traverse cities, countries, and oceans. This collection is remarkable for its well-crafted and fresh poetic language, and its courageous drive to confront the abusive legacy of the American and Japanese occupation, including the issue of Comfort Women. The jury consists of Fiona Lam, an award winning poet, essayist, editor, and creative writing teacher; Yilin Wang, a fiction writer, poet, and journalist who is pursuing her MFA in Creative Writing at UBC -- she is also the Poetry Editor at RIcepaper Magazine, and a member of Room Magazine's Editorial Collective; and Dr. Glenn Deer, who teaches Canadian Literature and Asian Canadian Studies at UBC, and has been a past jury member for the ACWW.